HATCH students celebrate graduation at the Waterfront Hall. 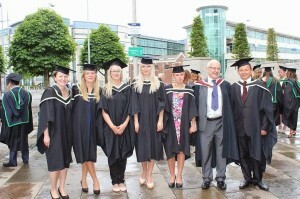 Cavan Innovation & Technology Centre > Hatch News > HATCH students celebrate graduation at the Waterfront Hall. HATCH students celebrate their success! Dympna McCarron, Project Manager described the recent event held at the Waterfront in Belfast as “well -earned recognition of the commitment of the participants into the programme and a celebration of the excellent results achieved”. Arthur McKeown, Course Director commented how “ the accomplishment of these students was all the more significant as all they all studied the programme through English – their second and sometimes third language”. The large event was also attended by graduates from the Advanced Diploma in Management Practice – Public Procurement. This programme was particularly designed for those in the Construction & Engineering Sector. Again this innovative and highly relevant programme has given students from this sector an opportunity to develop both professionally and personally. Important to the success of the HATCH programme in an overall context, is that all courses are delivered in a very supportive educational environment, accessible at local level, as all training is delivered in Cavan or Enniskillen.